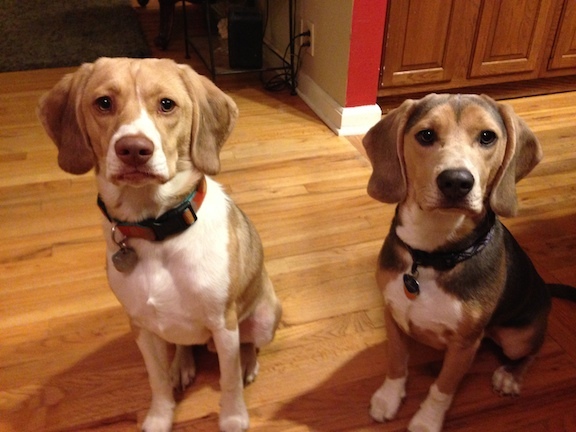 Today I was called in to work with Grady and Hank, a pair of eight-month-old Beagle mixes. Their owners contacted me to help put an end to several issues; chewing on the furniture, pulling on the leash, not follow their owner’s instructions or recalling on command. When I sat down with their owner’s, Grady immediately came over to investigate me, sniffing intently while Hank stayed near his owners barking a bit in protest. His owner had told me that Hank was wary of new people so I ignored him completely and offered Grady a little ear scratching while I discussed the situation with their owners. I noticed that each time Hank got anxious, he moved to be near his owners, one of which frequently gave him a scratch or pet for doing so. By providing this attention, his owners were conditioning the dog to come to them when he was unsure of the situation or uncomfortable. While this can be reassuring in times of high stress, its not a good idea for a dog’s only confidence to come from this proximity. To help Hank learn to develop a new way of dealing with this uncertain situation (my presence), I had his owners put him on the leash and hand it to me. I started to pull Hank over but he immediately started to pull against the leash so I stopped. I prefer to avoid forcing a dog whenever possible. Instead I used a few high value treats to entice Grady to come over to me. I was hoping that Hank’s curiosity and jealousy (desire for the high value treat) would override his fear of the unknown. It took giving Grady a small handful of treats before Hank’s curiosity got the best of him, causing him to come close enough for a good sniff. I stayed completely still with my head turned away from him and let him get a good whiff. As he started to walk away I stepped on the leash to block him from returning to his owner’s side. He pulled for a second but since I was motionless and not trying to pet or interact with him, he relaxed quickly and sat down. I offered him a high value treat, holding it from the side. At first Hank refused to look at me but was eyeing the treat a bit so I remained still. After a bit, Hank got a little closer and eventually licked the treat off my hand. I continued my conversation with his owners while Hank sat calmly next to me. After a moment he laid down at my feet. Only after I was sure that he was clearly comfortable did I attempt to interact with him. I put another high value treat in the palm of my hand and offered it out to my side for Hank. At first he was motionless and held his breath for a second before returning to a relaxed state. A few seconds later he leaned over and took that treat as well. I suggested that their future house guests interact with him in the same way. By ignoring the dog but also using a leash to prevent it from running away, we can help the dog learn that strangers are not a threat and in fact, offer a reward of tasty, high value treats. To address the chewing, I suggested a few hard chew toys and increasing the number and duration of walks. Often dogs who destroy things are bored, have too much energy or both. Because these dogs only recently got their adult teeth, much of the chewing was likely an attempt to deal with the discomfort of the new teeth impacting. That said, adding the concept of rules and boundaries can also help the dogs learn to temper their desire to chew the wrong thing. I went over a few basic rules to help with this and also showed them how to communicate a boundary for any object they want the dogs to stay away from. Next I asked their owners to put Grady outside so we could do some one-on-one work with Hank. I showed them a different way of offering a treat that caused Hank to become more curious. At first he was very hesitant, adopting a stiff body posture and did not come when called. But after some gentle coaxing, Hank started to relax and took on a more confident body posture and energy. Once this happened, he was much more responsive to the recall command. We continued practicing until Hank was coming over immediately and sitting politely in front of whomever called him. By practicing the recall command and using the leash to help Hank learn a new way to meet and interact with strangers, his confidence will increase. As it does, any anxiety and fears of strangers will subside.